NEW YORK, N.Y. - GPS will tell you how to get to the nearest Apple store. With iBeacon, Apple hopes to guide you around once you're inside, whether it's to pick up an order, upgrade to a new iPhone or shop for a pair of headphones. 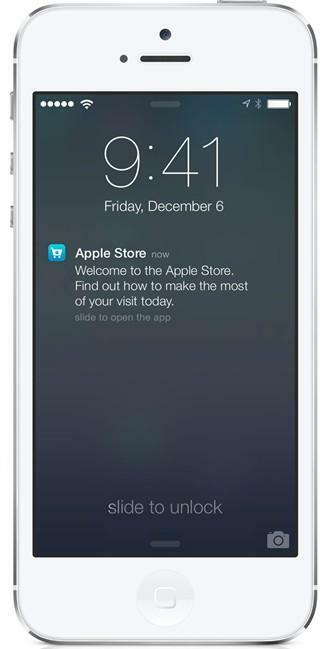 The implications of iBeacon go beyond Apple stores. One day, commuters might get information on subway delays as they stand on the platform, while museum visitors might get details on the painting they are standing in front of. Other retailers will be also able to offer deals or track which aisles shoppers linger in the longest. In-store location technology does raise privacy concerns, though many shoppers have shown a willingness to be tracked if there's something in it for them. "With any new technology, you don't know how it's going to be used until it is being used," technology analyst Rob Enderle said. He said Apple "is pretty good" at getting people to use new technologies, but it could take years for iBeacon to mature and reach its potential. He said Google, Microsoft and other tech companies will likely follow suit with their own location technology. On Friday, Apple Inc. began using the technology at its 254 U.S. stores to send you messages about products, events and other information — tailored to where you are inside, provided you have downloaded the Apple Store app and have given it permission to send notices based on your location. You must have Bluetooth turned on and have the latest operating system, iOS 7. Using the iBeacon feature, the app will notify you if the computer you ordered is ready for pickup, for example. Show a clerk your screen with the order number, and the clerk will get it for you. Walking by an iPhone table? You may get a message asking if you want to upgrade, check your upgrade availability and see if you can get money for trading in your old phone. Even without iBeacon, the app already lets you scan and pay for some items using your phone, get customer service help and reserve products. Major League Baseball already plans to use iBeacon next year to customize fans' experiences at its ballparks, through the At The Ballpark app. In a demo earlier this year, MLB officials showed how the app can offer special features based on users' location in a stadium, such as coupons in the souvenir shop or a video that plays near landmarks. Apple demonstrated the technology to The Associated Press this week at its busy, 24-hour Fifth Avenue store in New York City. At this particular store, Apple has installed about 20 iBeacon transmitters, some of which are simply iPhones and iPads, which come with the capability as part of iOS 7. The transmitters use Bluetooth wireless technology to give your phone more precise information about your location. That's not possible with GPS, which don't work well indoors and aren't good at distinguishing between locations that are just a few feet apart. Apple is not the first to offer in-store location technology. An app called Shopkick, for example, sends users discounts when they enter Macy's, J.C. Penney and other stores. But Apple's entry into micro-location puts the nascent technology into the hands of thousands of developers and broadens its reach considerably. Apple said iBeacon provides apps with "a whole new level of micro-location awareness, such as trail markers in a park, exhibits in a museum, or product displays in stores." Location tracking does raise privacy worries. After all, shoppers may not want their every move watched and recorded inside a store. Apple, however, said that it does not collect information about shoppers inside its stores. The company said notices are triggered when the app senses a location beacon nearby, without Apple's beacon needing to even know you're there. But other companies using iBeacon could go further, as long as people who download their apps agree to be tracked. Privacy advocates have raised concerns about the various ways that retailers track shoppers, whether it's their location, purchase history or how often they visit a store. But consumers often agree to be tracked in exchange for discounts. Tim Bajarin, a Creative Strategies analyst who's followed Apple for more than three decades, said he expects the technology to be a "little slow to take off." But he said that because all iPhones and Apple gadgets will support it down the line, iBeacon will have an "immediate built-in audience." "It's really up to the Macy's of the world, the stadiums of the world, to fully embrace it and be creative with it for it to fully take off," he said.